It’s that time of the year again where oriental food lovers have a reason to cheer! 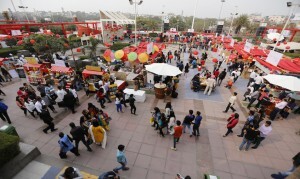 Select CITWALK is bringing back the much-awaited Asian Hawkers Market for the third time in two years and we couldn’t be more thrilled! So throw your diet out of the window and get set for a delicious weekend ahead with 21 stalls and 14 carts filled with oriental delights, curated specially for your taste buds! With bite size delights that are easy on the pocket, we make no bones about saying that entering this market is like entering foodie heaven. It doesn’t just end there; we’ve ensured that the entertainment is on point with flash mobs, bands and a whole lot more. If you thought the award winning chefs and restaurants and chefs from last year is the only thing on offer this year, the foodie in you is mistaken. We’ve come back with a whole new bunch of debutantes including the likes of the Gurgaon’s stand alone yummy Burmese restaurant, Burma Burma and our very own Yum YumCha’s home delivery chain, Noshi. Other new comers include the likes of JomJom Malay, East from Westin, Pings Café Orient and WaiWai City bringing the city a range of their range of instant noodles. 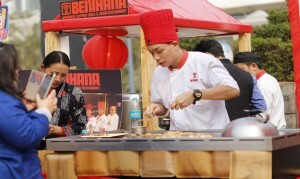 Don’t worry; you’re also going to see the staple favorites that include Mumbai city’s pride, Pa Pa Ya, teppenyaki favorites from Benihana, the acclaimed Bao’s from Fatty Bao, offbeat sandwiches from Big Fat Sandwich. Let’s not forget the famed Guppy and Asian Haus who are now constants at the Asian Hawkers Market. So come prepared with your heartiest appetite and more than just a few hours because as you’ve read, there’s a lot on offer. Make it a weekend to remember with families, friends, great food and even better times! What are you waiting for? Make your way to Select CITYWALK on the 21st, 22nd and 23rd of October!